Seems like all we do around the house as of late is paint. Its incredible what 20 hours of work and two gallons of paint will do for a room. 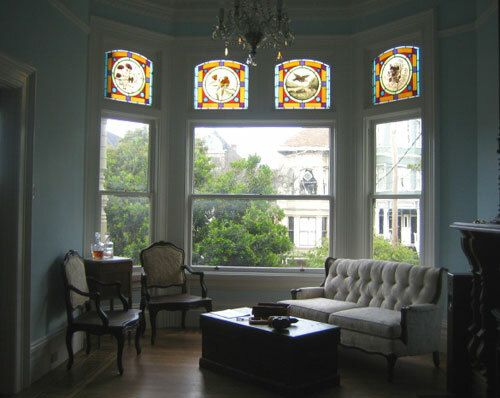 For this room we chose to Benjamin Moore’s “Light Blue” in satin for a formal victorian look. The blue really helps to bring out the colors of the original stained glass and makes the original glass chandelier pop. 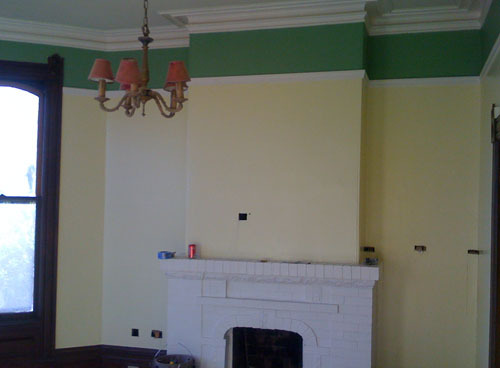 Luckily this room was white before hand which made things easy except for the ceiling which needed to be primed. The moldings were also in great shape except for a few cracks here and there which we quickly fixed. We finished all the trim in Benjamin Moore’s “Atrium White” as we have for the rest of the house to match. 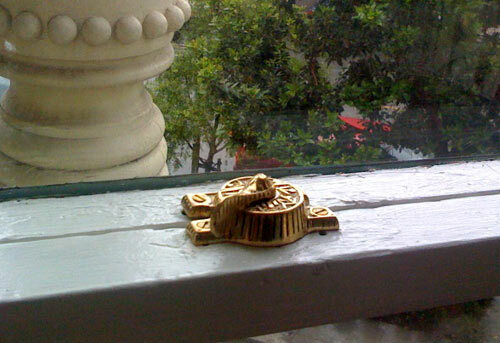 While we were in there we decided to upgrade the window hardware. Some of it was missing and some of it was broken. A quick online order through Restoration Hardware and we had period correct window matches that are almost identical to the original. 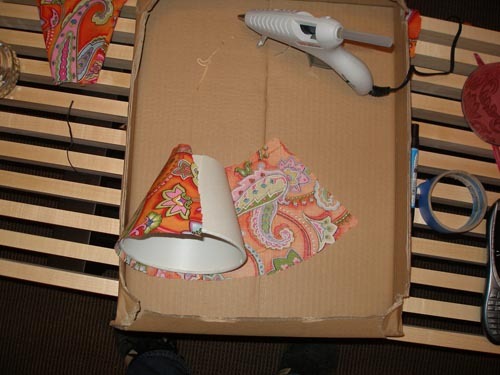 Here is the Flickr slideshow for the parlor set. Ugly chandelier aside, I have finally gotten around to updating my master bedroom. We’ve been so focused on the living areas for entertaining I haven’t had any time to focus on my room. Although I don’t spend much time in there, the time I do spend inst that pleasant. The colors were drab and sure didn’t make waking up for work any easier. After trying out a few different colors I finally settled on Benjamin Moore’s Celadon Green for the base and Garden Path for the top border, the same as the border in the living room. 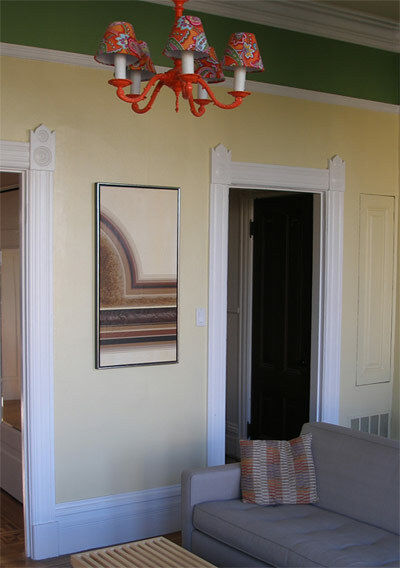 For the moldings we used Benjamin Moore’s Atrium White as we have in the rest of the house. After three days of solid work and a few gallons of paint later the room looks perfect. 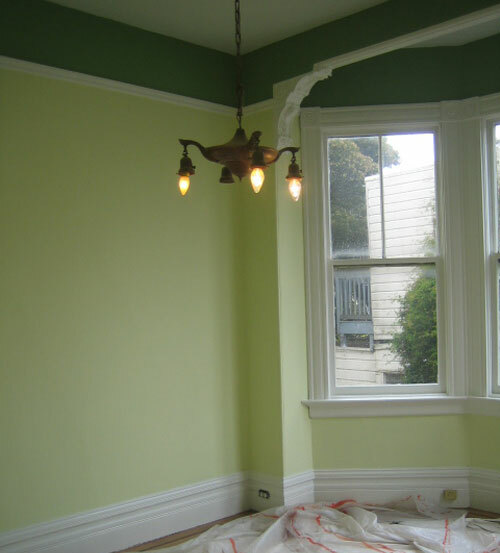 It is now light and airy and reminds me of key lime pie. 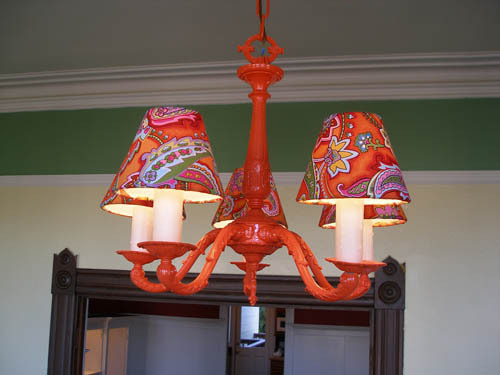 Although there is much more work to do on the top parlor, we have finally decided on color choices. I think it has turned out quite well, sans the brown molding. We chose Behr’s ‘Garden Path’ for the top portion and Benjamin Moore’s ‘Weston Flax’ for rest. 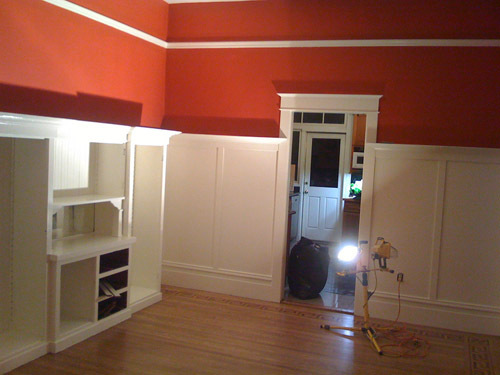 A lot more updates are on the way including swatches, furniture, and painting the hideous brown colored molding. For now this will have to do. Oh yea, and don’t mind those holes either. That’s where we are wiring up our sound system and television. To see all the pictures for this project click here. When we moved in, we immediately started figuring out our order operations; what was most important to us. It turned out to be a nice living area, a place to eat, and a kitchen. That being said, our kitchen was done, we had a temporary living room downstairs, so it was off to the dining room. My housemate loves to cook and I love to entertain so the dining room seemed to be a logical choice. What a choice that turned out to be! At first glance, we thought we may keep the wood as is, just sand and refinish. 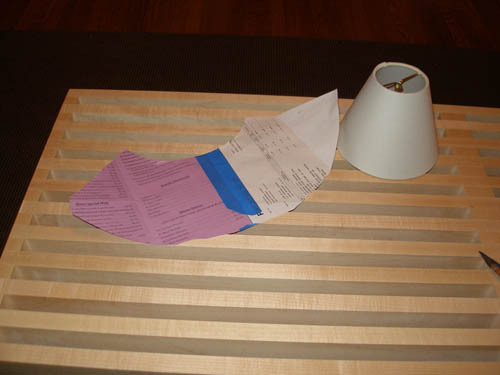 Upon further inspection, the wood was cheap plywood and it had been glazed over numerous times. Even if we wanted to refinish it, that cheap plywood would still show through. So, we decided to paint. After days and days of sanding and scraping off the old glaze it was finally time for a primer. We went with an oil based primer to bond with the oil based glaze that we had scuffed and sanded to create mechanical bond. That in itself was a daunting task. The stuff goes on thick but it was worth it. After a thick coat of primer applied a latex final coat of white. Well, three coats to be exact. We really wanted a deep rich white and that’s what it takes. Many many coats. The same holds true for the wall color that we chose. It is Behr’s “Old Flame”. It came out beautifully but took numerous coats. If out anyone knows anything about painting red it can be a royal pain. If you’re going to embark on this journey, don’t lie to yourself. It will take a minimum of three coats end of story. Brace yourself. In our case, it took four! But as you can from the results, its totally worth it.